It's almost here - the time of year where we stop to celebrate and reflect on the heart of the Christian faith. On Easter weekend, we gather to consider the implications of the news about Jesus for our lives today. You see, at the heart of Christianity is news about a person and an event. The person is Jesus Christ, and the event is his death and resurrection. If the news is true, if Jesus really died for our sin, and if God really raised him from the dead - then everything Jesus said and did and taught about God, about himself, about us, about the world we live in can be trusted. And that's good news because what Jesus says is that he loves us and wants to give meaning and purpose to our lives through our relationship with him. So whether you're a believer or a skeptic or somewhere in between, we invite you to join us on Easter weekend to consider the implications of Jesus for your own life and faith. All ages experience and time of reflection, as we consider the implications of Jesus' death for our lives today. March 30 at 7:00 pm. Nursery is open. Elementary and Middle School youth are invited to begin the service in the Sanctuary before moving into a Good Friday experience in the Fellowship Area designed with them in mind. 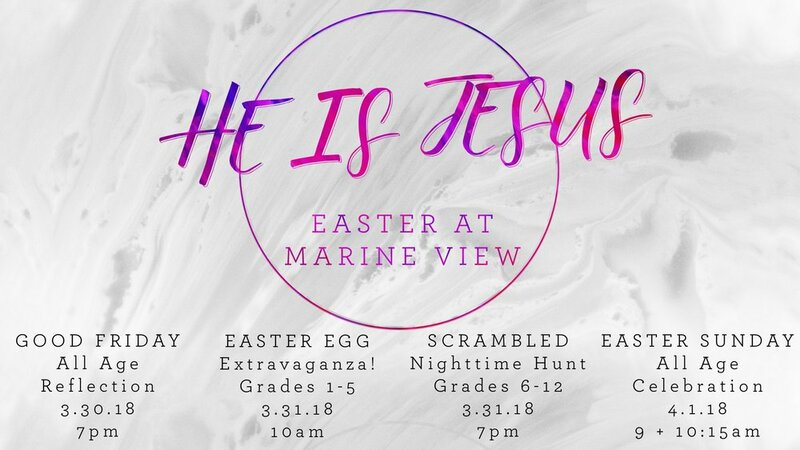 Marine View's annual Easter Egg Extravaganza with activities and fun designed for families with children: Birth - 5th grade. Door open at 10:00 am. Egg hunt schedule: 10:30 am (elementary), 11:00 am (preschool), and 11:30 am (all-ages). East Campus Building. Rain or shine we'll be celebrating together! 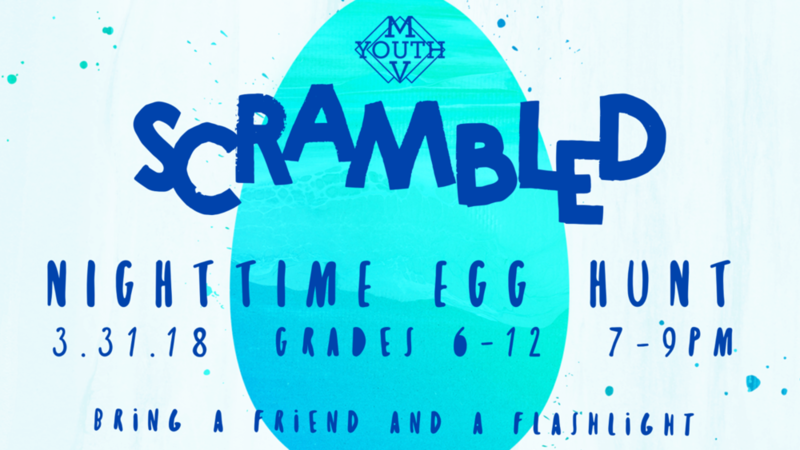 MV Youth presents the first ever night time egg hunt. Event starts at 7:00 pm in the Marine View East Campus building. Nursery is open for children preschool age and younger. Elementary age children are invited to join us in the Sanctuary for an all-ages Easter celebration. We know kids tend to wiggle, and we're glad about that - so we hope you and your kids will feel right at home! Activity bags will be provided. Should you need to step out of the service with your child for a moment, there will be guided activities available in the Fellowship Area and you can participate in the service through the live feed. Have questions or need clarification on dates, times and locations above - please reach out by commenting below or contacting the Marine View Church office. Whether you join in for one event or all, we look forward to welcoming you this Easter weekend! Posted on March 20, 2018 by MV Communications Team.